20 Short dramas based on Scripture from Luke's gospel. Michael Mangan and Anne Frawley-Mangan. 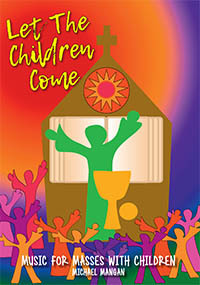 Our product range includes resources for Liturgy and Religious Education. along with child-friendly drama based resources to help scripture come alive. Michael Mangan is the best liturgical music writer/singer/presenter I have ever encountered. He is solidly based in the Church’s liturgical documents and presents his lively songs of faith with a flair rarely seen in Catholic circles. Children and adults love his songs, easily pick up the melodies and become willing full and active participants in liturgical celebrations. Browse our range of Products to find a wealth of songs and other resources to enhance your celebrations throughout the year. Listen to audio samples of the songs as you go. Looking for a song for a particular theme or occasion? Go to our Song Search for an extensive liturgical and thematic listing. Michael tours Australia, New Zealand and North America each year presenting live interactive Concerts for schools and parishes. Michael and Anne present Workshops & Professional Development sessions for teachers, catechists, music ministers and liturgy teams on effectively using music & drama in Liturgy & Religious Education. Check out our School Intranet Licence which allows your to upload your Litmus Productions audio recordings to your School intranet for one small annual fee.